Because of its (typically) light coloring and porous composition, grout is prone to staining. In a tiled entry or mudroom, dirt and grime are the usual culprits, while in the kitchen, spills are more likely to blame. Soap, mold, and mildew meanwhile make it difficult to maintain clean grout in bathrooms. Fortunately, cleaning grout effectively is possible using only common household products and a bit of elbow grease. • The best way to begin is with plain water and a stiff-bristled brush; most home centers and hardware stores carry an assortment of brushes specifically designed for this purpose. Simply spray warm water on the grout lines and scrub in a circular motion, then let dry. • For heavier dirt and mild stains, turn to that trusty old standby, vinegar. Fill a spray bottle with a half-and-half solution of vinegar and warm water. Spray on the grout, let it stand for five minutes, then scrub with a stiff brush. 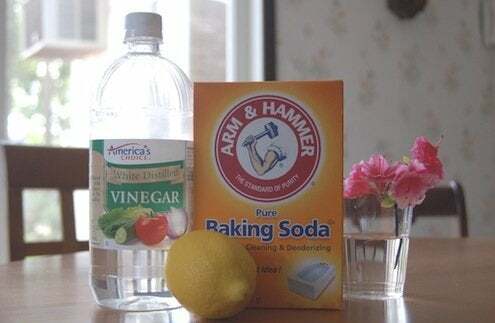 • To bring even more cleaning power to the party, make a paste of baking soda and water, cover the grout lines with the paste, then spray on the vinegar solution. Once the mixture stops foaming, scrub with a brush and rinse with plain water. • For moderate stains, you may want to use hydrogen peroxide, which is available in most drug stores. You can use the product straight or make a paste with baking soda and hydrogen peroxide. • For tougher stains and really grimy grout, try using oxygen bleach (most often sold in powdered form). Some common brands include OxiClean, Clorex OxiMagic, and Biokleen Oxygen Bleach Plus. Read and follow the manufacturer’s directions, and make sure the area is well-ventilated. Generally, you will want to let the oxygen bleach solution work for 10 or 15 minutes before rinsing. Always rinse with clean water so that the dirt doesn’t resettle into the grout lines. • Chlorine bleach and commercial cleansers can be used sparingly in extreme cases. 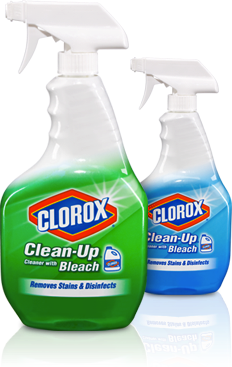 One of my go-to products when all else fails is Clorox Clean-Up spray. Long-term use of caustic cleaners will erode grout, so these products should be used on a limited basis. • Steam cleaners can be an effective and environmentally-friendly method of cleaning grout—or for that matter, many other surfaces around the house. Bissell, Oreck, Ladybug and Hoover all make steam cleaners for residential use.